In my opinion, one of the under-rated, overlooked, sources of high quality traffic is image search – and more specifically, Google image search. Not only is the search traffic on Google image search massive (not sure exact numbers), but it’s also global. Google has image search engines for all countries that have regular Google search. But more than the search being massive, and the traffic being global, the traffic to your website is highly targeted. If you optimize your images properly, targeting the right keyword phrases, then the referral traffic to your site will be highly targeted. 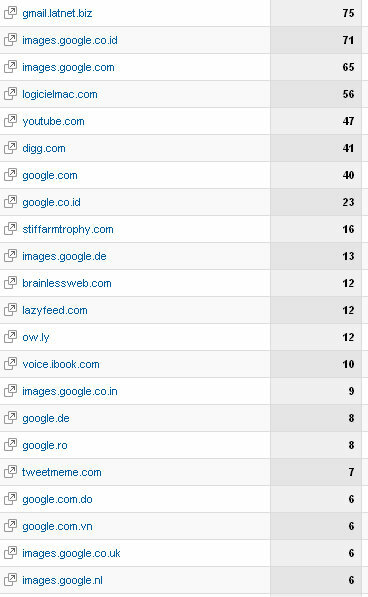 Notice all the different countries from which the traffic is coming to my site via Google image search. This is all free, highly targeted (keyword targeted) traffic coming to my site! 1) Get in the habit of using images in each of your articles, and on every page within your website. There are virtually unlimited resources on the web where you can grab an high quality, relevant image for your blog postings. Once you found an image you want to use for your article / web page, then you must first save that image to your desktop in order to upload it for use on your article. Depending on what you name the file, and how you structure the file name, will depend on how well optimized your image is for search results! Here’s the best, most optimal way to name an image file for maximum exposure in Google image search results. What matters is the words you use and the dash (-) between the words. So if I’m wanting this article to have the chance of being found in Google image search for a relevant keyword phrase, then I’m going to name the image I use in the article using relevant keyword phrases, and separating the words in the phrase with dashes (-). Some people might not find this relevant – or that it’s not really worth optimizing your images for search. If your image is found in the search results, and someone clicks on the image, then they are going to also visit your website or blog – the actual page or article the image is embedded on. This increases traffic to your site that otherwise would have never reached! And I’m always wanting to maximize every element of my blog to capture more relevant traffic – anyway I can – especially if it’s FREE!